When its hot out, you have limited options to fly fish in moving water. One is to fish a tailwater with stable temperatures due to bottom release, fish early/late, or head for the hills (literally). This time around, I decided to hit a tributary of the Squannacook known for its native brook trout population. While I won't divulge the name of this brook in this post, I will say that it does get stocked annually in the spring by the DFW and it looks remarkably similar to a north country stream due to the high gradient and ample pocket water. I wasn't expecting a whole lot due to the devastating drought of last summer that dried out some streams down to the river bed but I was pleasantly surprised by what I found. First pool produced nothing so my expectations were really low but next pool produced 2 small natives, which really got my excitement up. Releasing it back to the depths! Not all bugs were bad after all, evidenced by this beautiful (Hexagenia?) mayfly adult that briefly landed on the vest to dry its wings out. At first I thought it was stocked but after further examination of its colors and the perfect shape of its fins, I decided that it was indeed a native and a large one at that! It is absolutely amazing to see how resilient these guys are, especially considering how low and slow the water got this past summer. I hooked into a couple more decent fish in this pool that popped off fairly quickly unfortunately before I moved upstream. The further I moved upstream, the worse the mosquitoes got, to the extent that I couldn't stand next to the stream without getting swarmed. I skipped a very nice stretch of pocket water where I did reasonable well last year and went back to the road to avoid the bugs. Eventually, I spotted a nice series of pools up near the bridge that I decided to try for a few minutes before leaving. I found one nice pocket where I lost one and landed another. I tried the pool above it for a few minutes before calling it a day, having other commitments to fulfill. 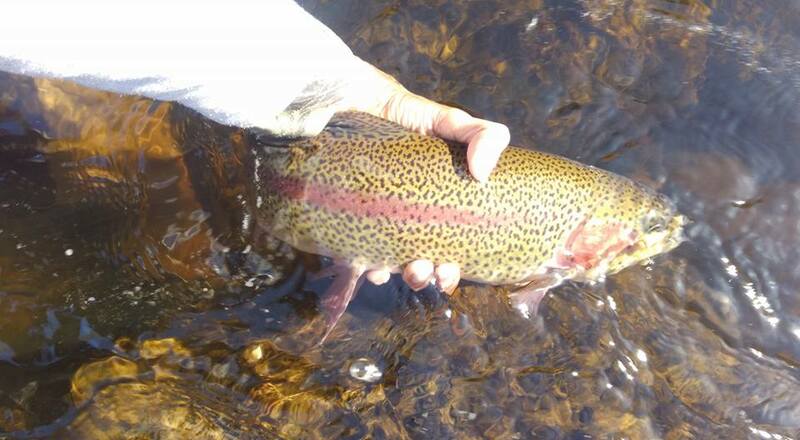 Around this time last year, the flow in the pool was much lower, to the extent that I could sight nymph for several brookies, chubs, and dace. The bugs were also almost non existent last year but I guess that is the trade-off for healthier stream conditions. Hopefully it should get better as the season goes on. With the higher water conditions, it seems like larger nymphs or flashy attractors (such as the SJW's pictured here) have been working better. My hare's ear got no love today but I don't think the fish were selective, they just saw the SJW better. Update: My first 2 trout of the day were caught tightline nymphing. While it wasn't an ideal set up considering leader length and lack of a sighter, I was able to feel the strikes at the end of the line. It is a fun technique and works very well on wild fish.